The School of Environmental and Biological Sciences Core Curriculum emphasizes the practical application of scholarship related to the environment and the life sciences integrated with critical thinking developed across the curriculum. 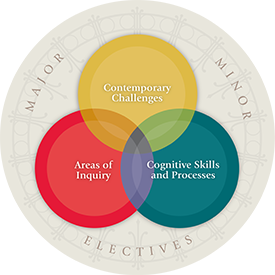 Use these Core Curriculum Requirements. Analyze a contemporary global issue from a multidisciplinary perspective. Complete and report on an applied experience (e.g., professional practice, service learning, or research) in order to examine and evaluate ideas within a discipline. Note: Most will complete this with a course in your major. 1. Understand and apply basic principles and concepts in the physical or biological sciences. 2. Explain and be able to assess the relationship among assumptions, method, evidence, arguments, and theory in scientific analysis. Examine critically philosophical and other theoretical issues concerning the nature of reality, human experience, knowledge, value, and/or cultural production. Analyze arts and/or literatures in themselves and in relation to specific histories, values, languages, cultures, and technologies. Understand the nature of human languages and their speakers. Engage critically in the process of creative expression. A single course may be used to meet multiple goals. All Courses must be credit-bearing, graded courses certified by the faculty as meeting core goals. (For example, E-credit courses cannot be used to meet goals, nor can pass/no credit courses.) Generally, SEBS students will need to take 12–16 courses to complete the Core, some of which may also fulfill major or minor requirements.